Everyone at some point and time needs to know the temperature and till now we had to rely on the mercury bulb type thermometers. Not any more, Jack Underwood has come up with a ultimate Android App to measure the temperature. 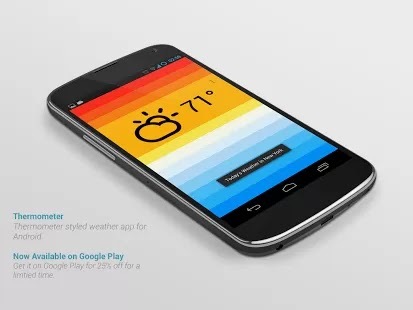 Called Thermometer for Android, it has just been posted on the Google Play. Available at cost of $ 1.09 or Rs.71.17 to buy but it is worth every penny. The App itself is very simple and small at 609Kb but the function it offers is incredible. It doesn't have any fancy interface like all the other weather Apps available on Google Play rather it has a minimalist design of colours from red to orange to yellow all the way to blue. The Red indicates its too hot and the blue indicating that it is too cold. The colours will change as per applicable temperature at the time you switch it on. You can download this must have App from Google Play here.